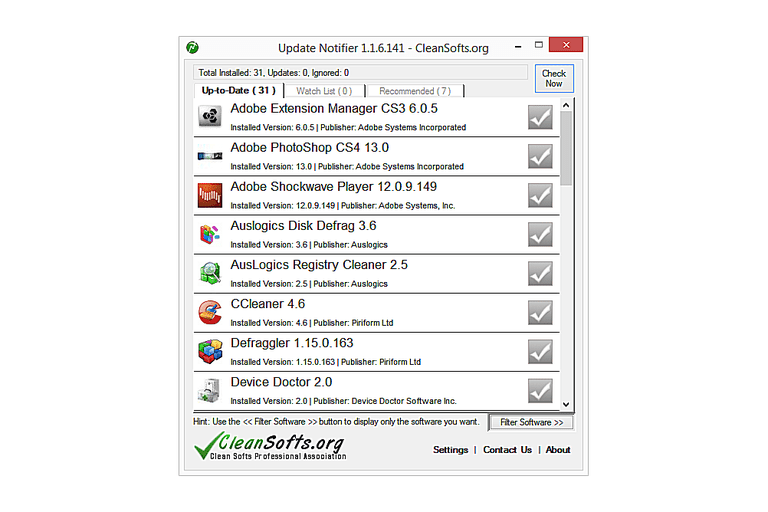 Update Notifier is a free software updater that does just as the name suggests - it notifies you of any outdated software and provides you with the download links. A unique feature worth mentioning about Update Notifier is that, to ensure genuine updates, it gives you direct download links to a program's official website that releases the software. This review is of Update Notifier version 1.1.6.141. Please let me know if there's a newer version I need to review. As you can see, Update Notifier has plenty of features to like. I prefer to use a software updater that lets me download the updates without having to visit a web browser, which means Update Notifier isn't my first choice when selecting such a tool. However, I do appreciate that all the updates are gathered on one page and are each direct links to the developer's website. This is still much better than not using a software updater at all. I'm also really glad there's a filter tool in Update Notifier because you don't really need to see all the programs you have installed to your computer when you're only looking for ones that need updates. With the Filter Software button, you can uncheck Up-to-Date Software so only the ones that require updates are shown. Another feature I like is the scheduler option in Update Notifier's settings. You can enable or disable the schedule and set it to scan your computer for outdated software every so many days and hours, such as every hour, every 24 hours, every week, etc. To use Update Notifier as a portable program, choose Run during setup to prevent it from installing to your computer.